In case you missed it - yesterday I shared a big try on session with my favorite - SWEATERS. I lot are on sale - some 50% off and more. I also couldn't resist picking up this sweater that was 50% off with free shipping. These are the cutest bow mules - and I love the mustard color. Also, in three other colors. These fur lined loafers that are only $25 (with free shipping). I think this tunic top may always be under $30 and 33% off - but it is a great basic staple. This cozy and warm fleece pullover - would make a great gift idea. I have this jacket in the longer version - but I love the shorter version and this harbor blue color. I am a sweater person - and I love this one that is under $30. A simple little black dress (LBD) that is under $20. A cute sweater dress that could be worn with some tall suede boots, and is $25. I am not headed on a ski adventure - but I would like to buy this sweater (to wear while I drink hot chocolate by the fire). A basic jersey tee dress for only $10. I just found the cutest plaid cape. And, if you are looking for a plaid coat - like the one above - I found this one or this one. This dress would look so cute with tights and booties. And, it’s 50% off with free shipping. This plaid shirtdress - you could layer a t-neck sweater underneath with tights and boots. This sweater is 50% off plus an additional 20% off. I have this sweater and I love it - it is 50% off with free shipping. Just in case you missed it - I shared some funny gifts and stocking stuffers HERE and HERE. 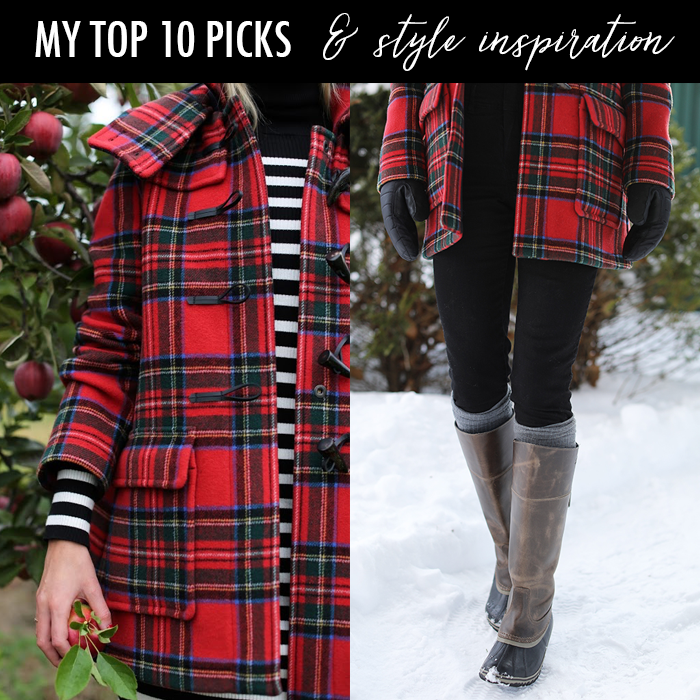 Drooling over that tartan coat over here! What a gorgeous piece to have in your closet this time of year.